Wildfowling involves hunting birds like ducks and geese in bodies of water like estuaries and marshes. If you don't like getting wet and cold, this probably isn't the sport for you! Wildfowler hunters need to have certain qualities to be successful. These include the need to be strong and patient. Wildfowling can last for several hours (sometimes up to a whole day), so patience is definitely a virtue! Wildfowl hunters also need to be able to quickly spot whether a potential quarry (a bird that you intend to shoot) is legal to hunt or not, sometimes in poor visibility. This is obviously an important skill for a wildfowl hunter to have, but it only needs a little bit of background research for you to become familiar with what constitutes a legal quarry. The British Association of Shooting and Conservation (BACS) has a booklet on its website on this very topic which is available to download in PDF format, so you can quickly become knowledgeable enough to know what you're doing. Dogs are frequently used to retrieve birds that have been shot from the water. More information on these dogs can be seen in our article on 'Gundogs and Hunting Dogs'. Ducks and geese are the main types of wildfowl that are involved in wildfowling, but there are other game birds that are classed as wildfowl like swans. Most wildfowl (but not all) have a resemblance to ducks. The wildfowling season starts on September 1st across the UK. It ends on January 31st in Northern Ireland, and February 20th in England, Scotland and Wales. However, you can only hunt ducks and geese after January 31st in England, Scotland and Wales. It's illegal to hunt wildfowl outside of the season, but this isn't the only time that you can't hunt them. In England, Scotland and Wales, wildfowling on Christmas Day is illegal, and wildfowling on Sundays is also illegal in Scotland and selected areas of England and Wales. Your local BACS office is likely to be able to tell you if shooting in your local area on Sundays is legally acceptable. Under the Wildlife and Countryside Act 1981, wildfowl need to be placed under special protection during certain emergency periods. Bad weather that lasts for several days or longer is classed as one of these emergency periods. If this is the case, shooting will usually be suspended until the weather improves. There will be an official announcement of this to make sure that all wildfowl hunters are aware of the situation. This may appear in national newspapers and magazines, or it may be restricted to specialist shooting and hunting magazines. Wildfowling isn't the best rural sport if you're not thrilled at the prospect of being cold, muddy and wet for hours on end. 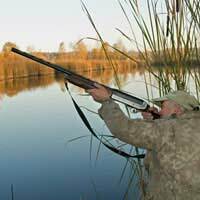 It's not uncommon for wildfowl hunters to only fire a few shots during a whole day. Wildfowling is a predominantly solitary rural sport, and most wildfowl hunters prefer to hunt on their own for fear of disturbing the birds too much. My dog is gunshy to the extreme and I live in a rural area. I want to walk him off lead up in the hills where there are bridle ways and public footpaths. What are the laws in regarding shooting in these areas? I just want to find a safe place for him. Thank you.